Create Professional looking Graphics and enhance your Photos or Images by using my online Graphics Designer and Image Editor. Choose from a large Graphics Library with thousands of Images, Photos, Icons and Cliparts to quickly design stunning graphics. 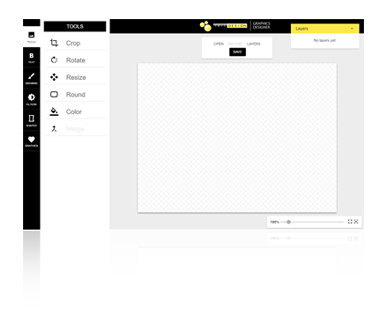 At first it is recommended to define the Canvas Size and then add a background. Either create a colored rectangle, image or color gradient or select a background from the Graphics Library. When you want to save your Artwork just click on “Save” at the top and save your graphic as PNG or JPG. Click on the Button on the right to open the Graphics Designer.